Divorce mediation requires complete and full disclosure of all information from both spouses in order to be successful. In complex marital estates with many assets and debts, such information can sometimes be voluminous. 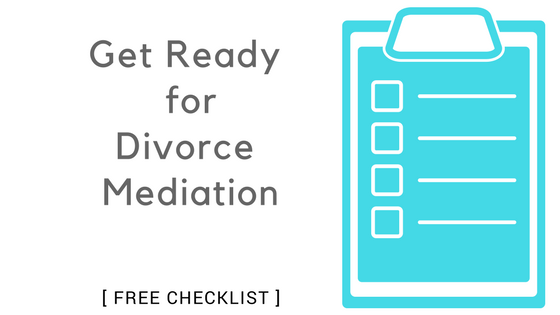 Believe it or not, many mediation clients will say that the initial document-gathering stage is the least enjoyable part of the mediation process. They report that once they gathered and provided all the documents for their attorney-mediator, the actual sessions ran much more smoothly than they ever could have imagined. Therefore, putting in more effort, time and preparation up front in gathering all of the pertinent information, will pay huge dividends later on for both you and your spouse when later analyzing your estate with your mediator and together making all those vitally important decisions for your respective futures. Download What's on the Table? to help you resolve your separation or divorce. Current balance statements for all children's accounts such as CD's, 529 plans or other custodial college savings plans. Current balance statements for all stock and bond investment statements. Make, model and year of all vehicles owned and a statement of the private party value for each as listed on Kelly Blue Book (www.kbb.com). Information of any pending civil lawsuit claims in which either or both spouses are a listed plaintiff(s). Statements of any outstanding loans, or verbal promises to repay a loan in which one or both spouses are the creditor(s). Current statements of all retirement accounts owned by each spouse such as company pension plans, 401(K)s, 403(b)s, 457's Thrift Savings Plans, TIAA-CREF, Traditional and Roth IRA's, SEP IRA's. Note that some plans may need to be valued by a professional actuary for their present day market value. Statements of all other employment benefits such as stock options, incentive, cash balance or golden parachute plans. Current market value appraisals for all real estate owned such as the primary residence, any vacation homes, timeshares, investment properties or vacant land, unless spouses agree that the property is being placed for sale. Personal Property--approximate value of the contents of all homes owned, all jewelry, art, antiques and other collectibles of specially significant value. Some items may need to be specially appraised for value if spouses are not able to agree on their value. Appraisals of all businesses owned for their estimated current market value, if elected by the spouses. Current balance statement for all mortgages, home equity loans or lines of credit held on any properties owned. Current balance statements for all motor vehicle loans. Current balance statement for all student loans. Statements for any other private loans, either verbal or with a written note, in which one or both spouses are debtor(s). Current balance statements for all credit card accounts. Information on any pending civil lawsuits in which one or both spouses is/are a named defendant(s). Copies of pay stubs/income statements of each spouse for the previous six months of all W-2 or 1099 employment. Copies of state and federal tax returns for the previous three (3) years and all corresponding W-2 or 1099 statements. Copies of corporate tax returns for the previous three (3) years if one or both spouses have a business. Declaration sheet for all life insurance policies held by either or both spouses, and a statement of the cash surrender value of any whole or universal life insurance plans. Declaration sheet for all disability policies held by either or both spouses. Copies of all pre-marital, and/or marital agreements in effect such as any pre or post nuptial agreements. Copies of any wills executed during the marriage. If one of you is feeling dubious about the completeness of the information that the other has provided, you will address this concern at your sessions. Your attorney-mediator will handle it in a way that is fair, non-confrontational, and which considers everyone's point of view. By collaborating together, you and your spouse will have pulled together all the information in your estate in a matter of only a few weeks while feeling as secure as possible that the information you provided to your mediator is both accurate and fully complete. Gathering documents are essential, of course, but you'll also want to assess all the issues to be laid out on the table.